Why do Wisdom Teeth need to come out? For oral surgeons, the most common procedure is removing impacted wisdom teeth. This is a common problem affecting 75% of the population. But there are many misconceptions in the population concerning wisdom teeth. Many people believe that all wisdom teeth must come out and then again there are those people who aren’t aware of the dangers of wisdom teeth at all. The most frequent clinical problem we see is pericoronitis, (a localized gum infection). Without enough room for a total eruption, the gum tissue around the wisdom tooth can become irritated and infected, resulting in recurrent pain, swelling, and problems with chewing and/or swallowing. Wisdom teeth are the last molar teeth to come in. One in each quadrant of your mouth, lower right, upper right, lower left, upper left. Technically they are third molars. The first molars arrive in your mouth around age 6 being nicknamed the 6-year molars. The second molars come in around 12 years old and carry a nickname similarly. 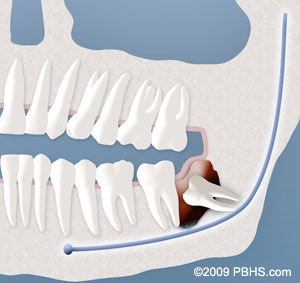 Third molars or wisdom teeth have a variable arrival time in the mouth anywhere between the age of 13 and 27. Most are to come in around age 18. Thusly they were named wisdom teeth because it was at that age when young men and women were assumed to arrive at a new level of wisdom. The purpose of wisdom teeth, just like any other molars, are to chew the food we eat. The wisdom teeth, it seems, were actually intended to fit into the mouth as we lost other teeth or as the other teeth wore down. But most people don’t lose other teeth and because our diets are refined we don’t wear down our teeth as much as our ancestors did (see “Why Do We Have Wisdom Teeth?”). The common issue with wisdom teeth is they do not fit in the mouth in a healthy way and are unable to attain a healthy position in the mouth the way teeth normally do–with the gums around the neck of the tooth. In other words, the crown would be in the mouth, the neck of the tooth would have gums around it and the root would be into the jaw bone. When the teeth are in this healthy position, the bacteria that populate our mouths are kept from getting down into the deeper spaces of our body because the gums create a seal around the neck of the tooth. If the gums were too high on the crown of the tooth they would not be able to make that seal because the crown is covered with enamel–the pearly white stuff you see when you smile. The enamel is hard and slippery like glass and prevents the gums from sticking to it and also prevents them from creating a seal when they are up around the crown of the tooth. All this information is important if you understand that many times wisdom teeth can’t attain that healthy position. They may develop slightly but cannot get the gums around the neck of the tooth. Or they come in sideways and break the seal between the gums and the tooth in front of them. In either one of these cases, the bacteria is able to get down into the tissue and create an infection, which is the number one reason for removing wisdom teeth. A different type of infection is a cavity. A cavity in the wisdom tooth or in the adjacent tooth caused by the malposition (or poor position) of the wisdom tooth is another common problem with wisdom teeth. The number one reason for removing wisdom teeth is infection. Another issue commonly associated with wisdom teeth is cyst formation. If the crown of the wisdom tooth is never able to come into the mouth, then that crown deep in the jaw bone can have a cyst created around it. That’s because all teeth start deep in the jaw bone and they have a follicle around them when they are formed. This little follicle is a tiny sac that helps them erupt into the mouth–when they break through the gums and come in. 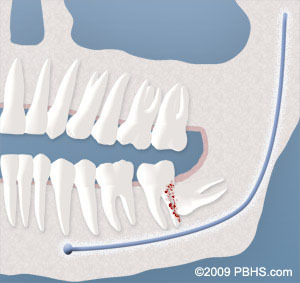 If the tooth never breaks through the gums to come in, then that follicle can enlarge and create a cyst. The cyst is very slow growing and cannot be felt but can be very destructive if left untreated. As it grows, it replaces your jaw bone with a fluid filled sac. If it gets big enough it can weaken your jaw bone, move other teeth and even break through the gums itself and get infected. There are many more reasons to get wisdom teeth out, but the bottom line is that wisdom teeth often don’t fit in the mouth in a healthy way and should come out. The way to judge this is to get an x-ray of the teeth and the jaw and have your dentist evaluate them. It may not sound like a very important procedure but taking care of impacted wisdom teeth can prevent problems associated with your gums, teeth, jaw bones and overall health in the future. You may be saying to yourself, “All of this sounds bad, but I’m not having any problems from my wisdom teeth right now. Why should I get them out?” If you are young and healthy, and lucky enough not to be experiencing any of these problems, we may recommend that you have your wisdom teeth removed prophylactically. In other words, you may elect (like so many others) to have your wisdom teeth removed intentionally before any of these problems can develop to prevent future issues before they can occur. Although we cannot say with certainty that you may experience one or more of the above issues, in most cases it is reasonable to recommend elective wisdom tooth removal while you are young and healthy instead of 20-30 years in the future when the risk of complications increases substantially. In some instances, infections caused from wisdom teeth can be life-threatening. In the early days of medical knowledge, there was a disease known as Ludwig’s Angina. This is a life-threatening swelling of the neck, tongue, and throat. At the time, they did not know what it was caused by. Now we know that it is typically caused by uncontrolled bacterial infections from the lower molar teeth, including wisdom teeth. Yes, wisdom teeth can cause life-threatening infections, even today with modern-day antibiotics. In the past several years we have rarely seen this case, but each one of them was extremely serious and their prognosis was guarded. Although these cases are extremely rare, the consequences of malpositioned impacted wisdom teeth are serious and the wisest thing to do would be to get them checked out by a professional.